Seattle-based artist Jeffry Mitchell will be the next PSU MFA Monday Night Lecture series guest. 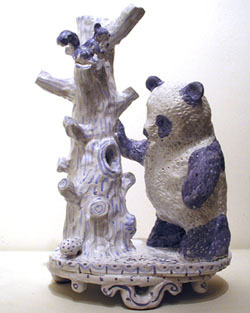 Mitchell's decorative ceramics and delicate drawings revel in the cute and the kitsch and his solo show at Pulliam Deffenbaugh last March showed off his ongoing fascination with the high/low dialectic. Jeffry Mitchell has had solo shows at the Henry Gallery, University of Washington, Diverseworks, Houston, TX, White Columns, NYC, the New Museum of Contemporary Art, NYC and the Seattle Art Museum. His works are in the collections of the Boston Museum of Fine Arts, the Contemporary Museum in Honolulu, the Fogg Art Museum at Harvard University, the Philadelphia Art Museum, the New York Public Library, and the Seattle Art Museum among others. Mitchell's work is so seductive and has a clumsy sensuality to all of it. Who knew the baroque could be on the verge of being cute? And why are we still having this high/low dialectic? Granted I think Mitchell confronts the subject very well, but it seems like this discussion really should have ended quite some time ago. Then again, that is somewhat like saying, "well, someone has already painted a portrait before, no sense in ever painting one again." Then that brings to mind, does the world need another portrait? Oh, life is such a vicious cycle.